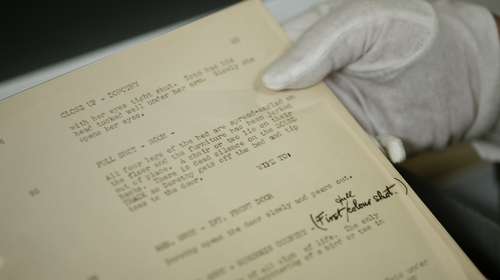 A collection of draft scripts for "The Wizard of Oz" and other material from the archives of the 1939 film which are to be auctioned off in December are expected to fetch up to $1.2m. Los Angeles auctioneers Profiles in History said four handwritten draft screenplays by Noel Langley were being sold. Langley, who died in 1980, was one of about a dozen screenwriters who worked on the big screen adaptation of L.Frank Baum's children's book that catapulted Judy Garland to fame and became an enduring movie classic. Langley's first three original drafts, dated between 5 April and 14 May 1938, are being sold alongside a fourth draft of the screenplay, written by Florence Ryerson and Edgar Allan Woolf, and a fifth draft from August 1938 by Langley. Some 16 photos of special effects, including the tornado sequence that transports Dorothy from Kansas to the magical land of Oz, will be included in the single lot. Profiles in History put an estimated sale value of $800,000- $1.2m on the archival material, which will be auctioned during its Hollywood memorabilia sale in Los Angeles from 11-14 December. "The studio assigned a number of scriptwriters and each scriptwriter did not know the other was working on it. The others kind of fizzled out," Chanes said. "Noel Langley is the one that really set the stage." "The Wizard of Oz" won just two Oscars, for its music, after it was released in 1939 but went on to become one of the best-known musicals in Hollywood history. In 1989, it was among the first to be preserved by the National Film Registry.